Both India and Canada have an established and a continuing long-lasting relationship. From business, to education, to import – export trade, to immigration, to tourism et al -the bilateral relations between these two former British Colonies is on the upward drift. Having commemorated the ‘Year of India in Canada’ just a couple of years back, both the nations are now looking forward to building strong and mutually prosperous trading relationships over the years. The future is bright and shining. Indians form the third largest immigrant group to Canada. The Indo-Canadian diasporic population is said to have crossed the one million mark. As the Indian footprint in Canada grows bigger, so does the need for a reliable courier services company that both connects and understands the two countries proficiently. That’s where we come in. 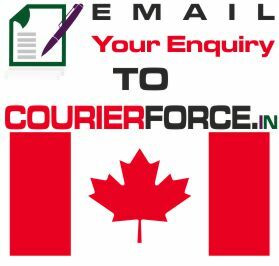 Courier Force, with its widespread network across all Canadian provinces and territories has emerged as a preferred choice for all Indians who keep sending parcels to their relatives in Canada. In the recent years there has been increased demand to send courier from Chennai to Canada. The courier charges from Chennai to Canada are the lowest in the market. Our courier partners help us to give cheapest courier service from Chennai to Canada. Whether you are planning to immigrate to Quebec or British Columbia or you are planning to study in any of the prestigious universities famed for its cosmopolitan and pluralistic environments, all your packages, documents, parcel deliveries and international courier needs to and from India is what we specialize in. If you are looking for a safe and speedy delivery to send cheap courier from Chennai to Canada, look no further. For our extensive network coupled with years of logistical experience and most of all our understanding of the Indian client’s needs vis-a-vis different geographies gives us a significant lead over all our competitors. You can safely assume that when it comes to high quality and best prices, we are amongst the leading Indian brands in the market that will help you to send international courier from Chennai to Canada. As we always say, be it Canada or anywhere, Courier Force is everywhere. On time. Every Time.